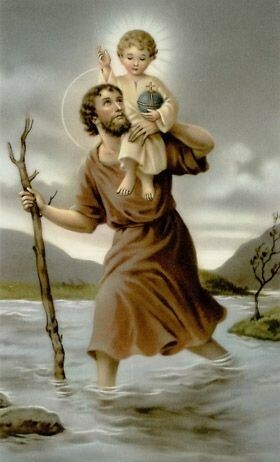 O Glorious St. Christopher you have inherited a beautiful name, Christbearer, as a result of the wonderful legend that while carrying people across a raging stream you also carried the Child Jesus. Teach us to be true Christbearers to those who do not know Him. Protect all of us that travel both near and far and petition Jesus to be with us always.